When Jim and Frank Oz taped Merv Griffin Salutes the Muppets (a.k.a. The Merv Griffin Show #3224) on June 26, 1984, it was part of the promotional efforts surrounding the premiere of the third Muppet feature film, The Muppets Take Manhattan. The movie premiered on July 13th and the show aired on the 19th. 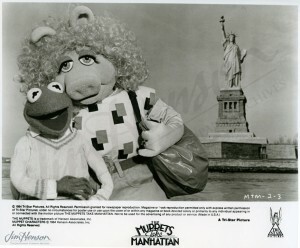 It featured Kermit the Frog and Miss Piggy singing “New York, New York” with Merv, and Rowlf singing two of his signature songs “Down Memory Lane” and “You and I and George”. 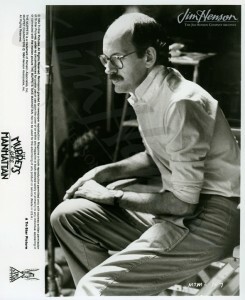 Frank Oz had a chance to discuss directing his first feature with Merv and Jim, and he also performed his characters Fozzie Bear and Animal. After a strong first weekend, this show helped to build audiences for the full run. Organized by Jim’s head of public relations Roberta Jimenez, the promotional plans for the film were extensive. Along with the regular television appearances including a series on Entertainment Tonight, there were promotions on packaging for Cheerios, Fritos, and Oral-B toothbrushes. There was an exhibit in Central Park’s Dairy building, and the print media were eager to feature the film. As Jimenez said in her memo to the team, “Frank, Jim and the Muppets are a desired commodity.” The Henson publishing department produced a storybook and comic book, and the consumer products division went into overdrive – particularly on what would become a very lucrative spinoff from the film — The Muppet Babies. In a fantasy sequence in The Muppets Take Manhattan, Miss Piggy imagines what it would have been like if the team had been babies together in the nursery. The action shifts to a group of puppets designed to look like the familiar characters as babies. From the moment they came out of the workshop, it was clear they would be a hit. 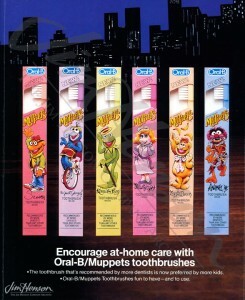 A music video featuring the Muppet Babies further underlined their appeal, and licensees starting lining up to create product featuring them. As a selling tool, Henson licensing executives Isabel Miller and Betts FitzGerald dressed up as English nannies pushing prams and filmed a promotional video in Central Park. The rest is spin-off history; Jim Henson’s Muppet Babies animated show aired for eight years before going into re-run syndication and won four Emmy Awards for best animated show. Director Frank Oz on the set of The Muppets Take Manhattan, 1983. 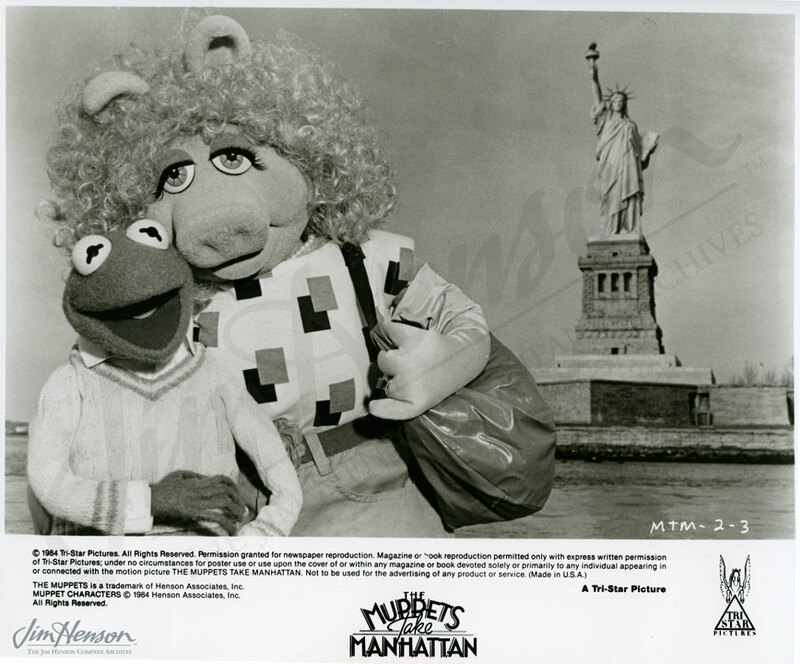 Kermit the Frog and Miss Piggy in a promotion shot from The Muppets Take Manhattan, 1984. 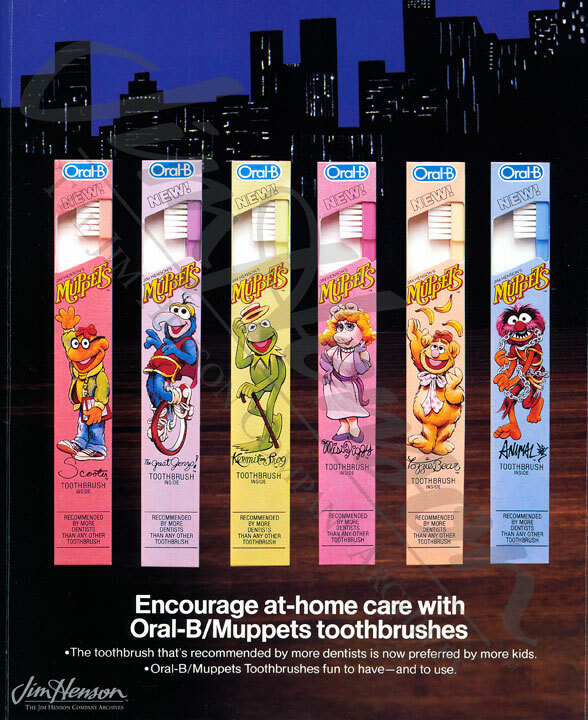 Oral-B Toothbrush-Muppets Take Manhattan promotion, 1984. This entry was posted in 06-June '84, 1984, Appearances, Muppet Babies, Muppets Take Manhattan and tagged Animal, Betts FitzGerald, Cheerios, Down Memory Lane, Emmy Awards, Entertainment Tonight, Fozzie, Frank Oz, Fritos, Isabel Miller, Kermit, Merv Griffin, Merv Griffin Show, Miss Piggy, New York, Oral-B, Roberta Jimenez, Rowlf, You and I George. Bookmark the permalink.